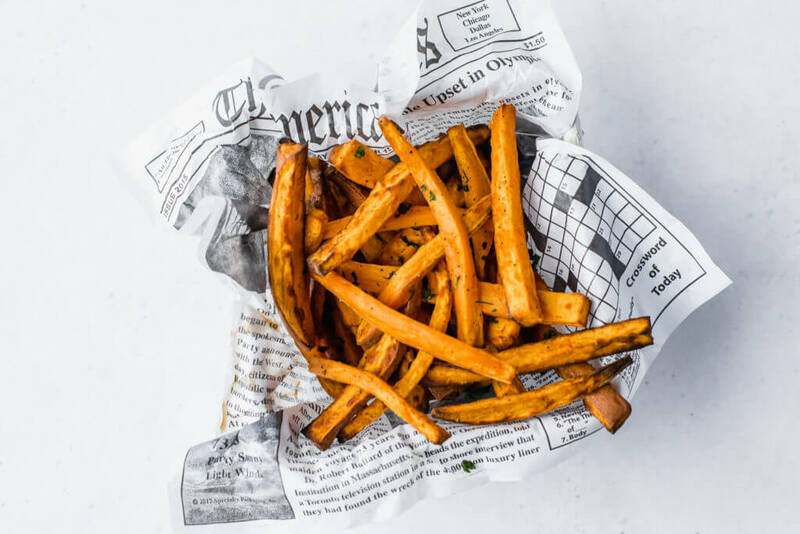 These air fryer sweet potato fries are so crispy and mouthwatering. 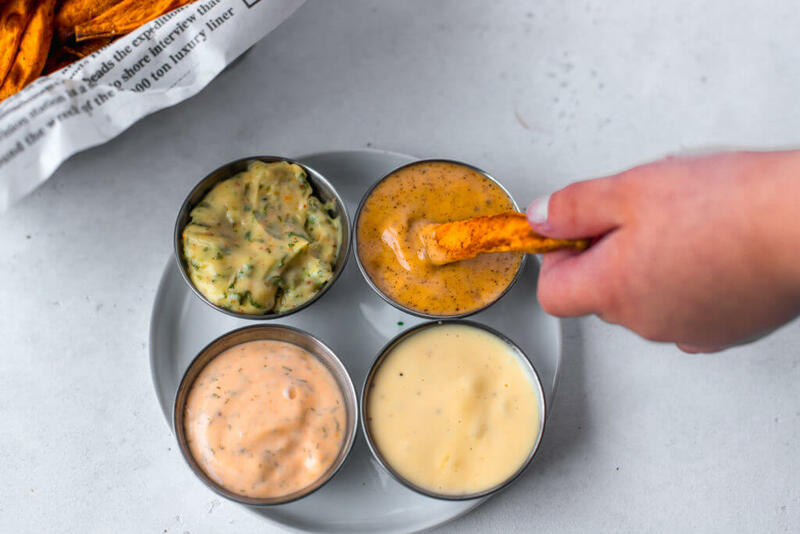 To add even more flavor, dip them in any 4 of my savory Majestic Sauces. They are Paleo, Whole30, and Gluten-Free. Sometimes I just crave a crispy sweet potato fry dipped in some magical sauce. Anybody else feel me on that? If I am making lettuce wrap burger or chicken tenders, sweet potato fries are a must. I find that getting sweet potato fries crispy can sometimes be a hard task. I worked on using my air fryer to come up with a crispy sweet potato fry and I would say, they turned out to be crispy and perfect. The best news, they only took 10 minutes in the air fryer. What is an air fryer and is it a good investment? An air fryer is a kitchen appliance used for cooking for really any and everything. There is a basket that food is placed in to cook. 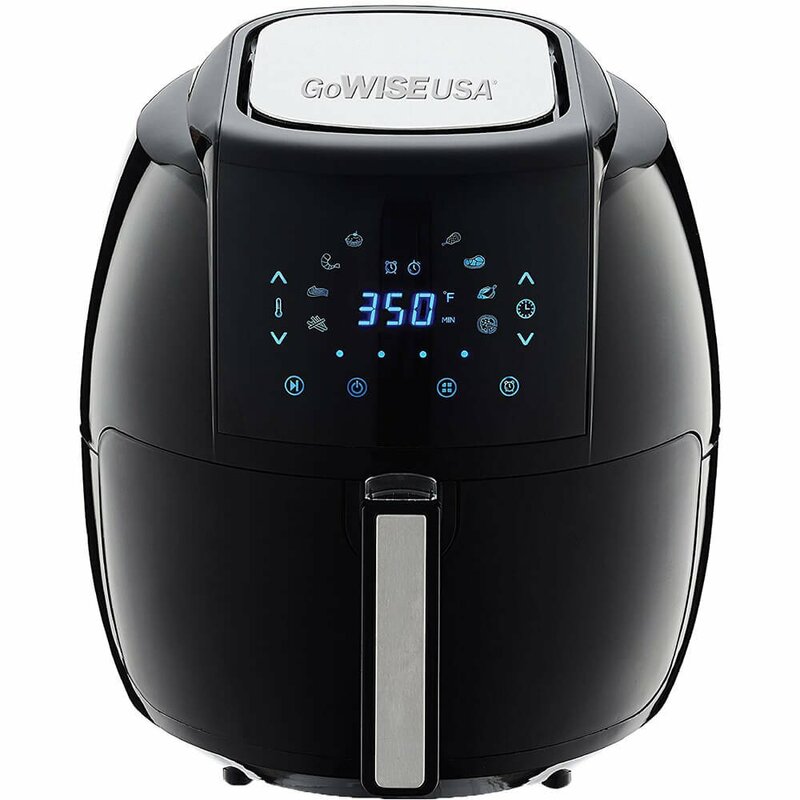 The air fryer blows heat around the space, which crisps up the outer surface of food. The air fryer is my TOP kitchen gadget and I use it weekly and sometimes daily. I love it because it cooks anything quickly and evenly. What’s the key to getting these tenders crispy in the air fryer? Spray the sweet potato fries with olive oil cooking spray. Shaking the basket ever 10 minutes to make sure they are cooking evenly. Increasing the temperature the last 5 minutes. 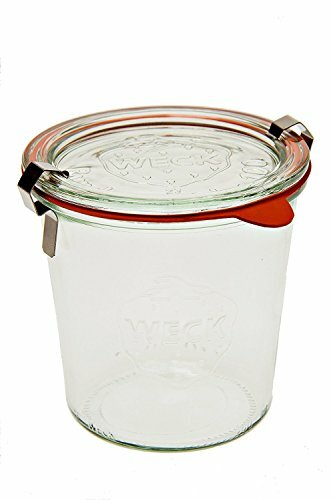 Can you freeze sweet potato fries after they are cooked? Yes. These are great to make ahead in a big batch and freeze in a freezer proof container. Anytime I make these I will make a double batch and freeze for easy side dishes that go great with a protein option on a busy weeknight. It takes no time at all to throw in the oven or air fryer to heat up. I will usually just put them back in the air fryer and cook on 400 F for 5 to 6 minutes are they are ready to eat. 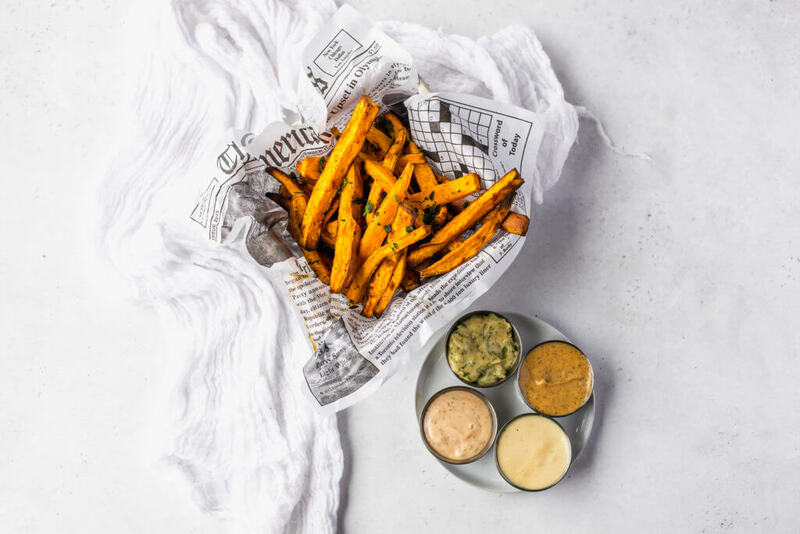 What is the best sauce to serve with sweet potato fries? Any of my Majestic Sauces are amazing with sweet potato and regular fries. My sauces include Chili Lime, Mac’s Awesome Sauce, Fiesta Cilantro, Fry Sauce and Buffalo Dill. I also use these sauces on top of salads, eggs, proteins, and veggies. 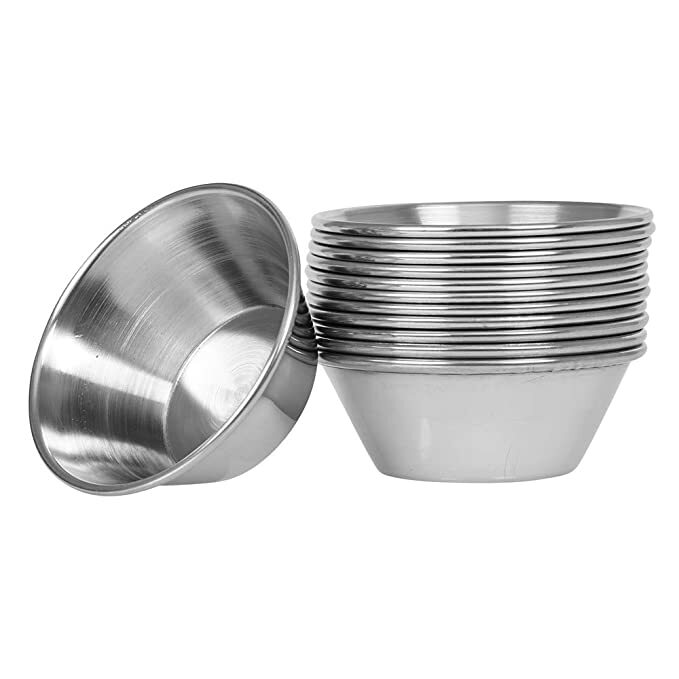 They are versatile and add so much flavor to any dish. If you are interested in grabbing these sauces, click the link below to all the recipes. Don’t forget to save this recipe to your Pinterest board. Click the photo below. Carefully slice each sweet potato into 1/4 inch fries. Transfer cut fries into a bowl and toss with 1 1/2 tbsp of olive oil, sea salt, garlic powder and pepper. In order to get a good crispy, place the fries in the basket with space between so they are not touching (May have to cook in 2 batches). Half way through, shake the basket. Serve with any four of my majestic sauces. Spray a little bit of cooking spray on the fries before cooking. Transfer cut fries into a bowl and toss with 1 1/2 tbsp of olive oil, sea salt, garlic powder and pepper. Add the fries to the baking sheet and make sure they are not overcrowded. Bake until brown and crisp on the bottom, about 20 minutes. Flip and cook for and additional 10 more minutes or until desired crispiness.